This is a Firefox add-on so simple and yet oh so handy. 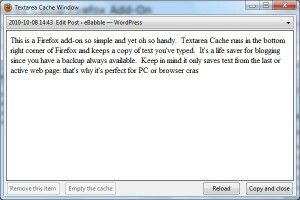 Textarea Cache runs in the bottom right corner of Firefox and keeps a copy of text you’ve typed. It’s a life saver for blogging since you have a backup always available. Keep in mind it only saves text from the last or active web page: that’s why it’s perfect for PC or browser crashes. 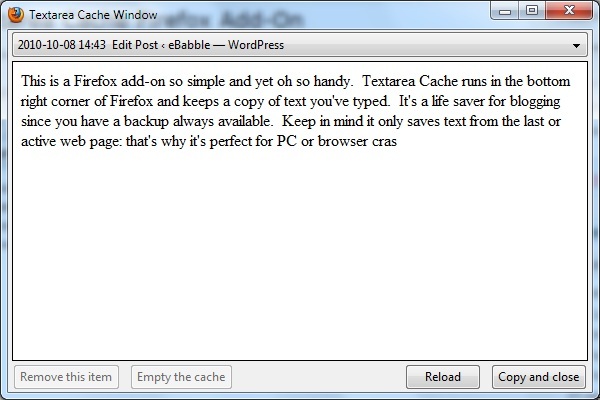 Above is the Textarea Cache window open for this post. It’s a lifesaver!